I've been making small flying devices since I was very young. As well as kites and model planes, in my teens I got very interested in building ornithopter (flapping wing) models. A friend, Gary Ruston, now sadly dead, built some incredible 4-winged 'insects' that flew amazingly well. Between 1964 and 1970 I lived within walking distance of Parliament Hill Fields, a favourite haunt of kite fliers. 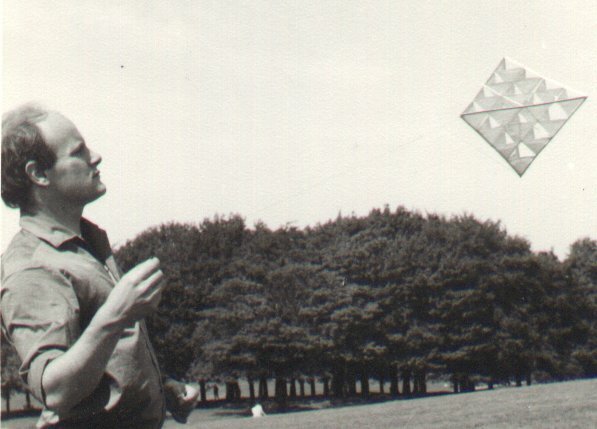 The picture on the left was taken there around 1967 and shows me holding a 16-cell tetrahedral kite of the type invented by Alexander Graham Bell. I built and flew many kites there and since then I've always had at least one kite.